You’re led to believe that using this shared data the software will enable you to profit regardless of whether the markets are high or low & due to it’s automation you’re also said to be able to earn 24/7 too… But is this so-called elite investment club really legit or will the Elite Entrepreneur Club scam you & just end up taking money from you instead? What Exactly Is The Elite Entrepreneur Club? 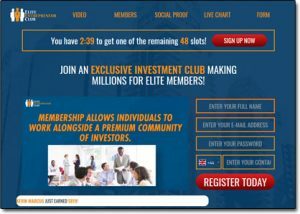 The Elite Entrepreneur Club is a newly launched website that promises it’s going to provide its members with access to an “exclusive investment club” in which they will be given the opportunity to use a piece of so-called automated profit generating software. So in short they’re basically leading you towards believing that the software will be copying the exact same trades that are made by these so-called elite investors… However at no point are you told who these investors are, and more worryingly nor are you told who actually runs the whole thing. A legitimate copy-trading place should give you all of that information, like the place on my top picks page does. There’s literally NO information whatsoever on the Elite Entrepreneur Club website as to who runs it, which country it’s based in or whether or not it’s even licensed (which it is required to be by law). That’s a HUGE red-flag & I can tell you right from the off that’s also a common trait of a get-rich-quick scam. In fact I can also tell you right now that that’s exactly what the Elite Entrepreneur Club is – a scam – and the reason I can say that so confidently is because I’ve seen this exact same type of scam several times before. It’s what’s known as a binary options scam & whilst they are less common now (thankfully) throughout the past few years the internet has been full of them. I myself have exposed hundreds right here on this blog like the Profit Formula scam & Binary Option Auto Trading system but they regularly keep changing their names & websites in order to catch out more people. But obviously I don’t expect you to just take my word for it when I say that… After all I appreciate that you might have been hoping the Elite Entrepreneur Club software was really going to work for you – so if you keep on reading I’ll show you what’s really going on so that you can see for yourself why it 100% won’t work. How Does The Elite Entrepreneur Club Work? However whilst there is indeed some trading software on the back-end of the whole thing I can’t tell you that it WON’T make you profits & the reason for that is because the whole thing has actually been designed to make you lose. So ask yourself this question – why would a binary options broker pay the creator of a system which generates guaranteed profits for getting new people to sign up? The answer is simple, they wouldn’t – because if they did they’d up out of business. In short the brokers don’t want you to make money – and this affiliation itself proves that the whole thing is a scam. The brokers are in on it and they know that when you use the software you’re 100% going to lose. That’s the real reason they’re paying the creator commissions. The truth is that binary options trading is extremely risky – it always has been and over the years I can safely say that I’ve never actually seen anybody manage to make a sustainable profit from it. 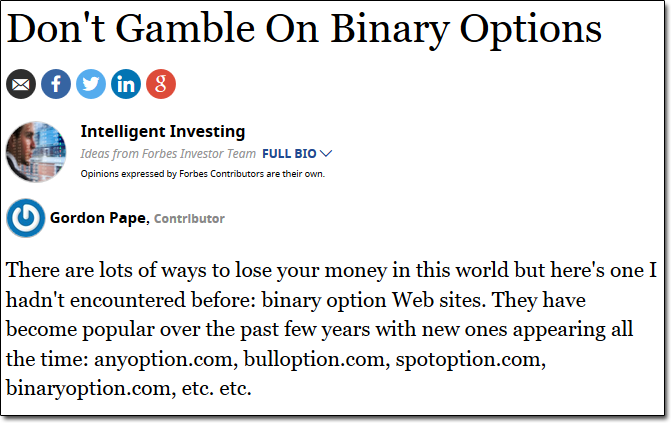 But when it first came out most people weren’t away of the risks, because the problem with binary options is that on the surface it looks really easy. All you have to do is place a bet as to whether you think the value of something will rise or fall & if you’re right, you make money. It sounds super simple & as a result it drew thousands of people in – but there’s a catch… Firstly the time periods that the “bets” are made over are ridiculously small (often under 60 seconds) meaning there’s no way you could accurately predict the direction in such a small time window… And secondly if you win you simply get your money back + a bonus, but if you lose you lose everything – so it’s geared in the brokers favour. Since it first launched though many publications (like those above) have made people aware of the dangers & some countries like the US have even gone to the extent of banning it completely, so this means fewer people are now trading. As a result the brokers are no longer making as much money & essentially they’re desperate to get their profits back, hence why they’re creating/funding these fake trading systems like the Elite Entrepreneur Club to sucker people in. They know that so long as you think you’re going to profit you’ll trade, and so they create (or fund) all of these fake systems that promise easy guaranteed riches – but clearly they never actually deliver. These brokers & the people that create the fake systems are very cunning & as a result they’ve designed their systems/program/software in a way that makes them seem entirely risk-free to trick people into “trying them out”. The trick is that they claim their software is 100% free, and that all you need to do to get access to it is make a deposit via their “recommended” broker. This makes you think that you’ll be able to simply “try it out” (even though you might be thinking it’s a scam) and get your money back if it doesn’t turn out to actually work as promised. What they don’t tell you though is that most of the brokers they refer you to are unlicensed & that they will make it very difficult – almost impossible – for you to actually get any of your money back once you’ve deposited… Unless you run a chargeback. So in short they’re not risk-free at all & you should expect any money you deposit to essentially be gone for good. Whilst the whole “risk-free” approach is one of the biggest tricks deployed by these binary options scams it’s certainly not the only one – in fact most of these scam sites are absolutely full of lies & deceitful tactics. And then there’s the fact that they’ve tried to make it look big names like Bill Gates, Richard Branson & Elon Musk have endorsed the system by cutting some of their videos & editing the subtitles… But if you actually listen to the videos you’ll realize what they’re saying is completely different to what the subtitles are saying & that they do not mention the Elite Entrepreneur Club at all. My Verdict – Is The Elite Entrepreneur Club a Scam? Yes hands down, there’s absolutely no doubt in my mind that the Elite Entrepreneur Club is a scam. It’s built entirely on lies & deceit & its sole purpose is to trick you into depositing with a rogue binary options broker so that the creator of it can earn some money at your expense. Any money you deposit will be lost so it’s certainly not “free” like you’re led to believe & after making a deposit (which I don’t recommend doing) you’ll be left to find out the hard way that the software doesn’t work as promised. For those reasons I recommend steering well clear of the Elite Entrepreneur Club software and instead if you really want to make good money online legitimately then I urge you to check out my free guide here as it’s there that you’ll get the proper training you need to see success. On top of that I always recommend you check out my list of top picks for making money too as there actually several different ways you can go about it & depending on your situation you can find what’s best for you. 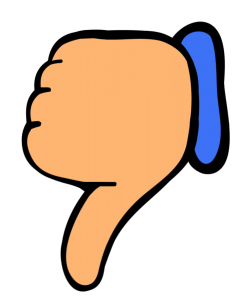 But whatever you decide to do the one thing I sincerely hope is that my Elite Entrepreneur Club review here has given you a good insight into how it really works & hopefully you can now see why it should be avoided. I also hope my review has helped you save some cash too! Fast Free Commissions Review – Hype or Legit? Is MineTech Farm a Scam? Read My Honest Review Before Joining! Easy 1 Up – Scam Exposed? My 2018 Review Uncovers How It Works!